A Pixel Entity in search of Time. Download a pixel graphic pack now! Pixel art never dies. Doesn't matter how realistic and mesmerizing other videogame graphics get, we just don't grow tired of the good old bits. There's a neverending troop of gamedevs that are in love with retro-style videogames and keep exploring and expanding the ways of the pixel. This kind of art is everything but old-fashion; artists constantly redefine it and prove the beauty that can be achieved by focusing in the square-by-square process. I'm Felipe, an artist and designer, a traveler, and an addict to pixel art and videogames. I'm passionate about videogame art and I want to openly share my work with the world and form a community of pixel lovers. But the main problem is that slippery substance called time, I don't have enough, or at least not as much as I would like to dedicate to my pixel work. I have to make a living, and unfortunately, in this world time is money. So I came with a crazy idea and created this weird creature called squareaddict who is obsessed with finding time to invest in pixel matters. 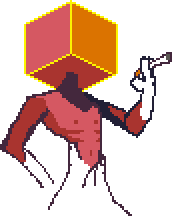 squareaddict is an entity of the 2D world (with an athletic body and a pixel-perfect boxy head) who is trying to escape his plain reality to become the God and creator of his own world by evolving into a 3D being. His conflicting relationship with reality has him addicted to his pixel cigar, and the only way he can be saved is by finding an impossible matter of the 4D world: Time. If you like my pixel art and you want to see more (whether you want to use it for you gamedev projects or you just enjoy the 8-bit aesthetics) consider supporting this Patreon. You can pledge as few as $1! And if you don't have that much don't worry, you can always help me by SHARING this page, talking about it to your friends and relatives, or just participating with your kinds comments and opinions here or in any of my social networks. Sometimes that can be even more helpful than coins! Follow squareaddict on his journey thru social media! Don't forget to SHARE this page so everybody can benefit! Just a bit of support that will help me keep creating tutorials for free! You get access to my exclusive Discord server where you can share and learn from the community. You get access to high quality files of all my tutorials. You can vote in polls to decide the theme for the next tutorial. You get access to all the extended tutorials with practical exercises and in-depth lessons. You can download all my asset packs for free and use them in any project you like. You get access to wips, bts & dump sketches. I will be releasing a new tutorial at least once every other week. That means 2+ tutorials every month!